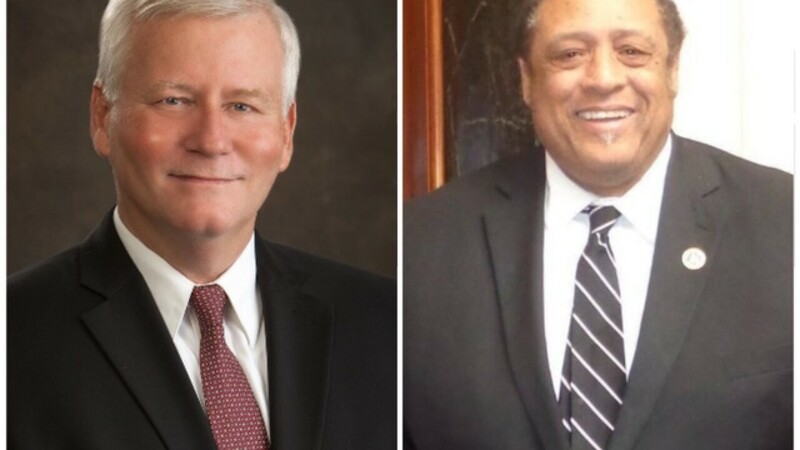 Democrat Jim Glenn's lawyer, Anna Whites, said in her election-interference filing Monday that Republican DJ Johnson and his attorney "intentionally violated the integrity of the proceedings by forcing a vote count change and by interfering with the vote count process." The result, she said, was that election officials in Daviess County gave Johnson an additional vote. "That is an impermissible result, but more importantly, that reflects intentional and effective interference in an election by counsel, who are under a legal duty not to meddle with elections and results," Whites wrote. Whites said the "spoiled ballot" should be removed from the vote count. Also, anyone from Johnson's legal team found to have interfered with the vote count should be disqualified from the case, she said. Johnson's legal team responded that the Republican and his lawyers "behaved appropriately" at the recount last Saturday in Owensboro. The voter casting the disputed ballot had marked the box for a straight Republican ticket, Johnson's lawyers said. The local elections board, however, initially interpreted the voter's intent as a no-vote for Johnson, his lawyers said. After hearing the local board's initial reaction to the ballot, Johnson's lawyer "merely advised" the local county attorney of a regulation that applied to the matter, his legal team said. Neither Johnson nor his lawyers discussed the matter directly with the local elections board, they said. "There is no evidence of interference — because it did not happen," Johnson's lawyers said Monday. "And there is no basis for this Election Contest Board to reject the county board's treatment of the ballot at issue." The Election Contest Board is a Republican-dominated panel of Kentucky lawmakers investigating the election. It's unclear what comes next as lawmakers prepare to reconvene this year's legislative session on Tuesday at the state Capitol in Frankfort. The Daviess County Clerk's Office must send a report to the Election Contest Board, which must decide what to do next and give a report to the Kentucky House, which has ultimate say in the matter. A state law indicates the board must choose the winner by drawing lots. But Whites has noted that Glenn has already been sworn in and seated as a state legislator, and the only way he can be removed is by impeachment. Glenn would sue against any attempt to remove him from office, she said. The Kentucky State Board of Elections certified Glenn as the winner after election results showed he had edged Johnson, the Republican incumbent, by one vote. Glenn was sworn in on Jan. 5 and has an office and been assigned to committees. But the Republican-controlled legislature ordered the recount at Johnson's request. On Saturday, the Daviess County Clerk's Office recounted more than 12,000 ballots by hand. Glenn emerged from that process ahead by three votes. But after a personal appeal from Johnson, the Daviess County Board of Elections — which consists of two Republicans and two Democrats — voted to give Johnson one of those votes back, putting him down by two. The board then reviewed 17 absentee ballots that it had unanimously rejected on Election Day. This time, the board decided five of those ballots were legal and opened them. Johnson received three of them, Glenn received one and one ballot was blank. That made the final results a tie, with each candidate receiving 6,323 votes.